We make beautiful painted wooden clocks & export them around the world. These wall clocks are 12X12 or 18X18 inches, we use diff. painting techniques like abstract painting, rajasthani miniature painting, cone painting etc. 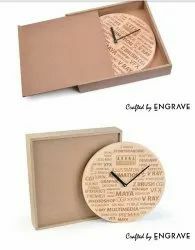 We also supply to corporates for gifts. With the assistance of our dedicated team of professionals, we are providing a premium quality range of Wooden Clock. Clock Dia – 30 cm. We are widely recognized manufacturer and supplier of a populous range of Antique Wooden Clocks in Jodhpur, Rajasthan, India. The offered Antique Wooden Clocks are highly attractive and smart in design. Available in more to choose from. 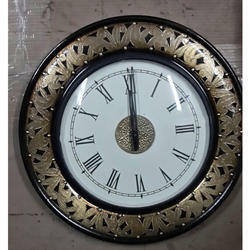 This WARLI handpainted Zig-Zag clock will accentuate the magnificence of your home. The base of the clock is deliberately handpainted with different hues to give a class and sheen. Wonderful dhokra dolls on tickers upgrades its excellence. This analog clock is deliberately made from recylced wood.